BAGHDAD, Iraq (CNN) -- Brad Blauser lives in war-torn Baghdad, where he doesn't earn a paycheck and is thousands of miles from his family. But he has no intention of leaving anytime soon. 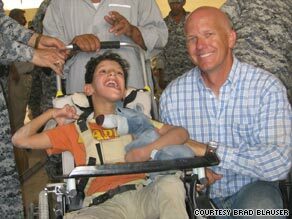 Since 2005, Brad Blauser's Wheelchairs for Iraqi Kids program has distributed nearly 650 free wheelchairs. "Disabled children -- they're really the forgotten ones in this war," said Blauser, 43. "They are often not seen in society." "There's no paycheck. It's not really safe here. But this is a once-in-a-lifetime opportunity," he said. "A number of families don't know what's wrong with their kid. There's not a doctor available for help [and] there's no pediatric wheelchair source in this country," Blauser said. "So I asked him, 'What do you need?' " Blauser recalled. "And he surprised me by his answer: 'I need children's wheelchairs.' "
"The experience for me in the first distribution was awesome," said Blauser. "To see the smile come across their face and [to] look over at the mothers and fathers -- they've definitely been changed." That's the case for 3-year-old Ali Khaled Ibrahim and his family. At 8 months old, Ali was struck by a mysterious fever that left him partially paralyzed. He cannot speak and experiences increasingly frequent and violent convulsions. "Ali's handicap affected the family a lot," said his father. His mother said she couldn't carry out her daily chores and her "psychological state worsened." Today, Ali smiles at home as he sits in his new wheelchair. His siblings giggle and sprinkle his face with kisses. The toddler's parents are thankful for the relief it has brought not only to Ali, but their entire family. The boy is among hundreds of disabled Iraqi children to benefit from Blauser's generosity. Since 2005, Wheelchairs for Iraqi Kids has distributed nearly 650 pediatric wheelchairs. To obtain the specialized chairs, Blauser partnered with Reach Out and Care Wheels, a nonprofit pediatric wheelchair organization in Montana. The organization provides wheelchairs designed for rough terrains in developing nations, making the devices "perfect for this environment," said Blauser. For Blauser, who provides part-time safety consulting in exchange for room and board, an initial plan to stay for one year has become a dream to get wheelchairs to every Iraqi child who wants one. And he's determined to see it through. "By providing what they need, I'm hoping to start a movement to change the way people think about disabled children," said Blauser. "They are not a curse, they are a blessing and they deserve to have their needs met." Want to get involved? Check out Wheelchairs for Iraqi Kids and see how to help.